• There are 146 rooms and 34 suites. • Large restaurant and a bar overlooking on the Babelplatz. • conferences room for up to 250 people, 5 meeting rooms for up to 150 people, large swimming pool, wide range of treatment rooms, spa with with sauna and area relaxation, and a gym center. • 1887: Construction of the building as the headquater of Dresdner Bank (now Commerzbank) under the architect Ludwig Heim. • 1889: Opening of the Dresner Bank Headquater. The four courners of the ballroom still immortalise the four main offices of the Bank located in Dresden, Bremen, London and Berlin. • 1945: The building and all Dresdner Bank subsidaries in the soviet part of Berlin were closed. Confiscation of all Dresdner Bank properties by the Soviet occupation forces. • 1952: Renovation of the Building after World War II under the architect Richard Paulick. • 1968: Foundation of the Staatsbank der DDR (Central Bank of East Germany). • 1990: Dissolution of the Bank following the reunification of Germany. After the reunification of Germany the Building remains empty and unused. Dresndner Bank tries without succes to get the building returned. • 1998: The Building is used to make the fil « Lola rennt » by Tom Tykwer. The film included an invented « Deutsche Transfer Bank » where the father of the main figure Lola works. The Bank scenes were filmed in the empty bank building. • 2003: Hochtief, a German construction company buys the property from the Berlin Oberfinanzdirektion for 30 million Euros. 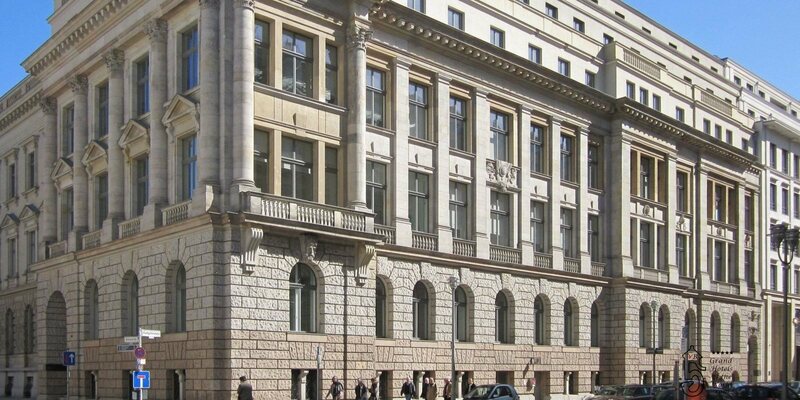 • 2004: Real estate development of the former Dresdner Bank Building within the « Opern Carrée Project ». The budget is 150 million Euros. • 2006: October 12: Opening of Hotel de Rome as a Rocco Forte Hotel. The former funds hall of the Dresdner Bank is now the Ballroom of the hotel.